A consensus All-American in 1963 and ’64, the “Kansas Comet” rushed for 2675 yards and had 3917 all-purpose yards in college. He was chosen by the Bears in the first round (fourth overall) of the 1965 NFL draft (he was also a first-round pick of the Kansas City Chiefs in the AFL draft). There were questions about his blocking ability, but not his speed and running instincts, and Sayers moved into the lineup. The 22 touchdowns set a NFL record and included a record-tying 6 in a single game. Bears went 9-5 to finish third in the NFL Western Conference while leading the league in touchdowns (54). Sayers followed his sensational rookie season by leading the NFL with 1231 rushing yards and setting an all-purpose yardage record with 2440 in 1966. He led the league in total yards for the third straight year with 1689 in ’67. Sayers received consensus first-team All-NFL honors and gained selection to the Pro Bowl after both years. He was on his way to another great year in 1968 when he suffered a season-ending knee injury in the ninth game that required surgery. Still, he rushed for 856 yards, had 1463 all-purpose yards, and again received consensus first-team All-NFL honors. 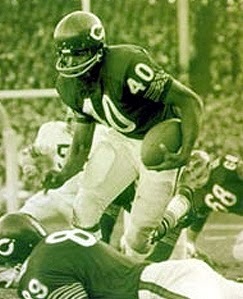 Sayers made a successful return with a woeful Bears team in 1969, leading the NFL in rushing for a second time with 1032 yards. But further injuries in 1970 and ’71 ended his career. Overall, Sayers rushed for 4956 yards on 991 carries (5.0 avg. ), caught 112 passes for 1307 yards (11.7 avg. ), averaged 14.5 yards on 27 punt returns and a NFL-record 30.6 yards on 91 kickoff returns, totaling 9435 total yards and scoring 56 touchdowns. His career may have been brief, but he made an impression, as he was a consensus first-team All-NFL selection five times and was selected to the Pro Bowl on four occasions. The Bears retired his #40 and Sayers was inducted into the Pro Football Hall of Fame, Class of 1977.